I regularly visit London. It’s partly to see my two children who live there; sometimes I visit my sister and her family, and sometimes dear friends. But I also go to see London! – to see exhibitions, galleries, explore some part of London that I don’t know well, walk in the parks, shop. So much to see, so much to do! I’ve lived there at various times during my life. My parents moved there when I was nearly 2 years old. They had a tiny little house in very central London, not far from my father’s work in the Foreign Office. This was in the early 1950s so London was still recovering from the war – a lot of bomb-damaged sites, seeded with the bright yellow of wild ragwort. I loved to balance on the low ruined walls, holding my father’s hand, as he walked me to kindergarten on his way to work. 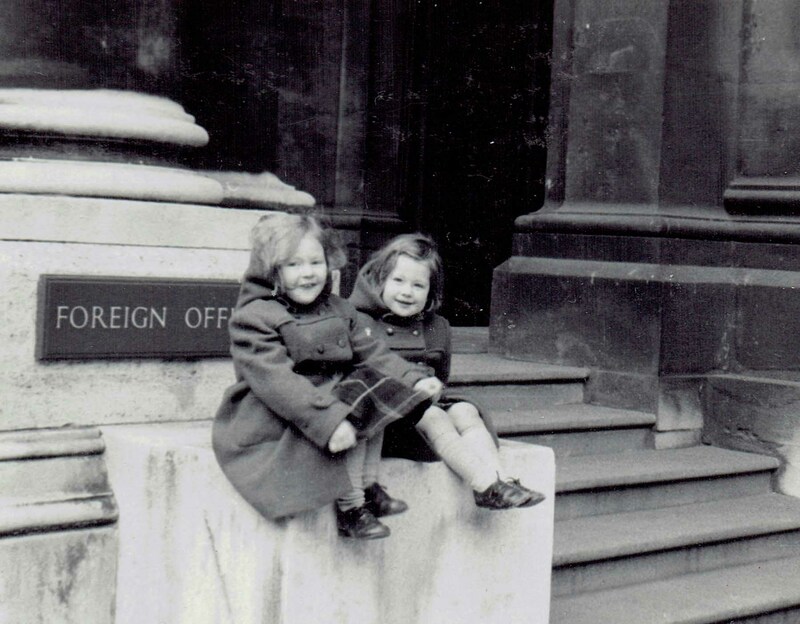 Sometimes he took my sister, Marian (on the right in this picture) and me to his office nearby in King Charles St. (King Charles Street is close to Downing Street, and I don’t think you could casually walk up to the Foreign Office front door any longer as both streets are now gated off.) 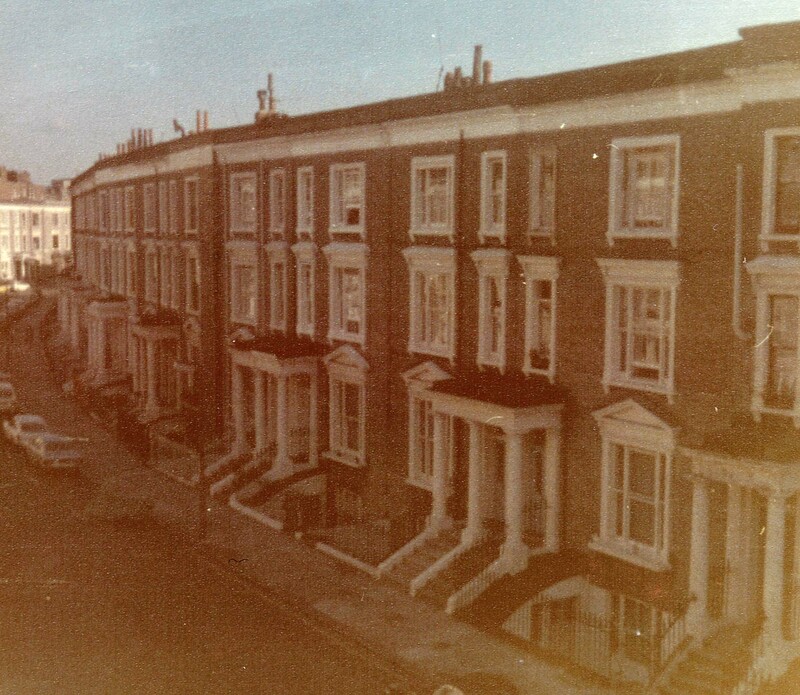 My parents didn’t stay in London long, so my next stop there was in the 1970s, when I had finished at university. 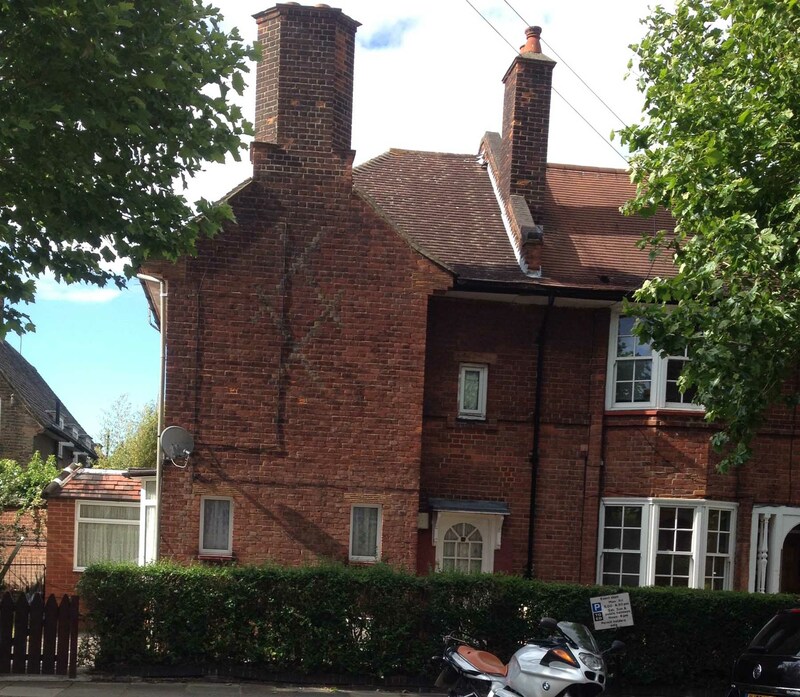 I shared the top floor flat in one of these imposing Earl’s Court houses with two other girls. By this time, London was a much more multi-cultural city. Earl’s Court was known as a particularly Australian back-packer haunt. It’s busy main street was full of money exchange shops so visitors from all over the world hung out there. Through the years, as I’ve lived in Kent, Oxford, Devon and now Northumberland, I’ve travelled back to London regularly. These days my visits are focussed on my children’s homes in North London, and I’ve had to learn my way round parts of London I’d never visited before. I used to get panic attacks in the underground, so my journeys around London are almost entirely by bus. But what a lot you see from the top deck of a London bus! 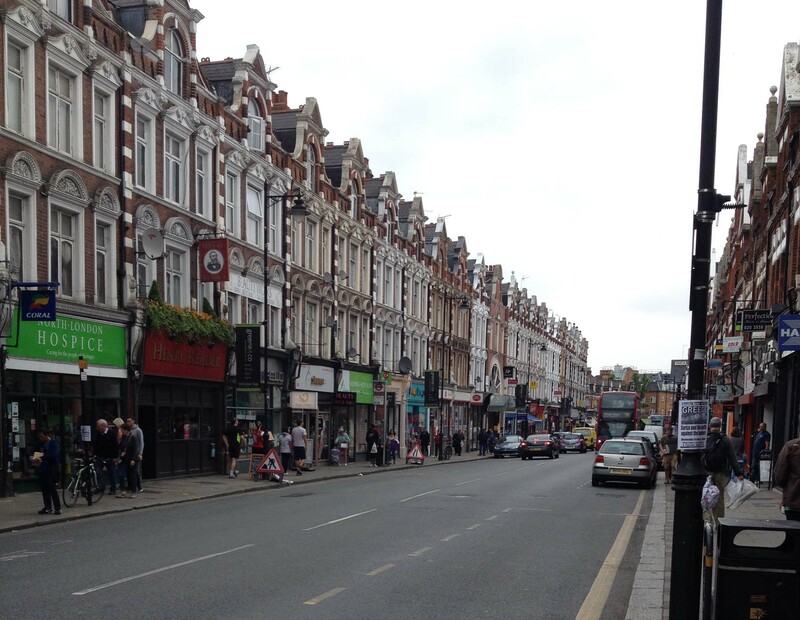 Here is my journey starting on the Saturday in Crouch End. 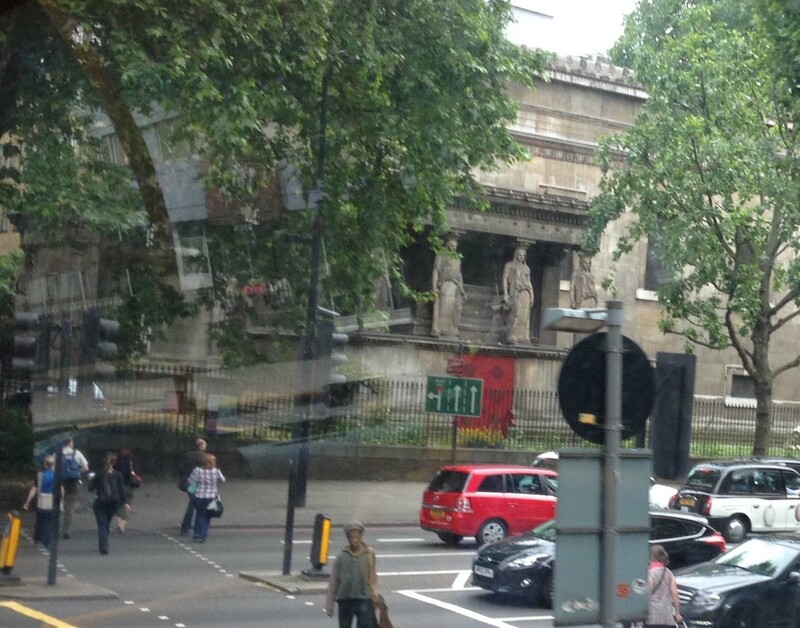 We are heading into central London, to the British Museum. 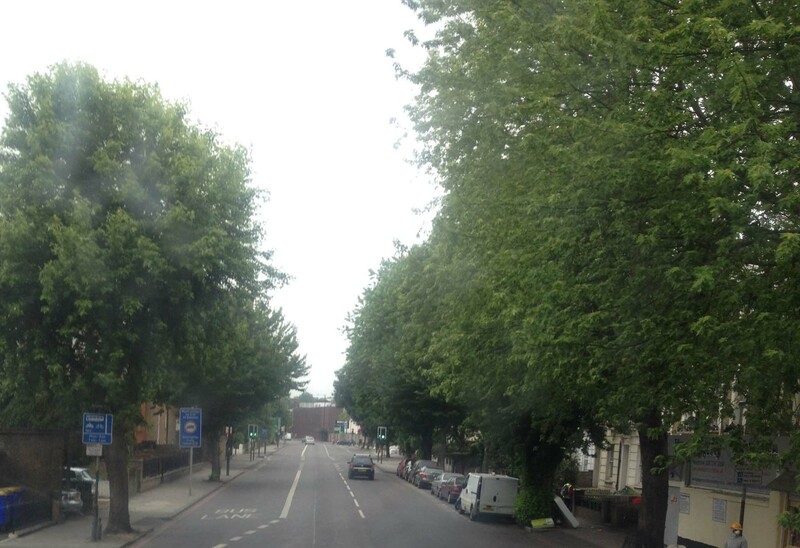 I am struck – as ever – by how green London is – trees, parks, gardens, all gloriously green. 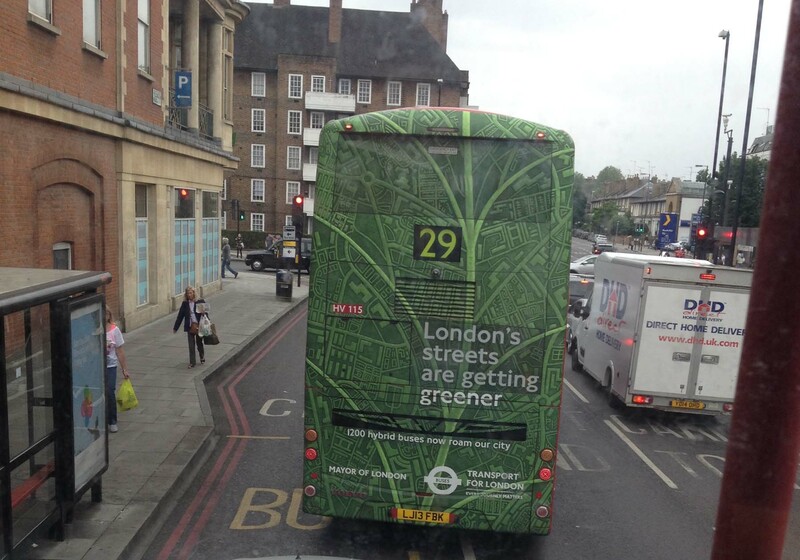 Even London’s traditional red buses are sometimes green. And, what also stands out amidst the greenery is the amount of building work going on. There’s a lot of money at work here. (The affluence of London is particularly striking to one coming from the more impoverished north of England.) I’m fascinated by the glimpses of old London amidst the hustle and bustle of modern ways. 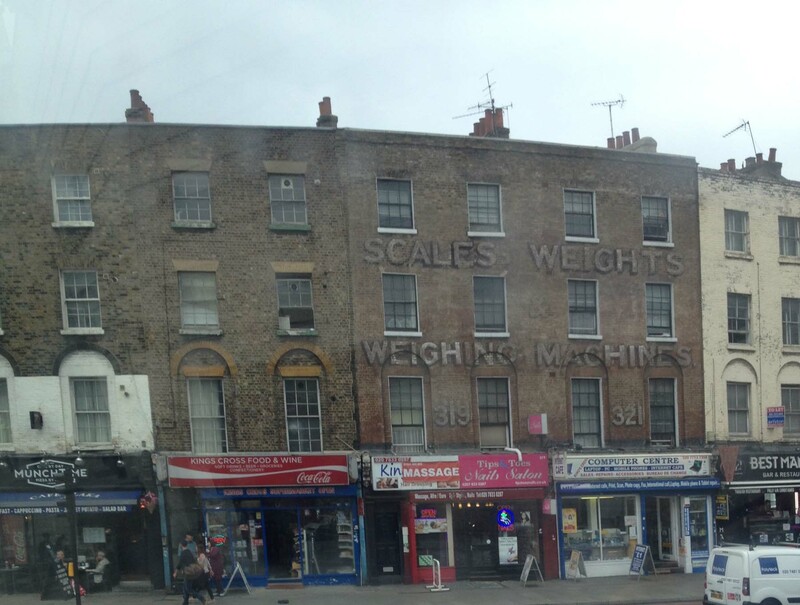 The fine old painted sign on shabby shops 319 and 321 remains to tell us that they once sold Scales, Weights and Weighing Machines. Nowadays there is a Massage Parlour, Nail Bar and Computer Centre – all a sign of the times. 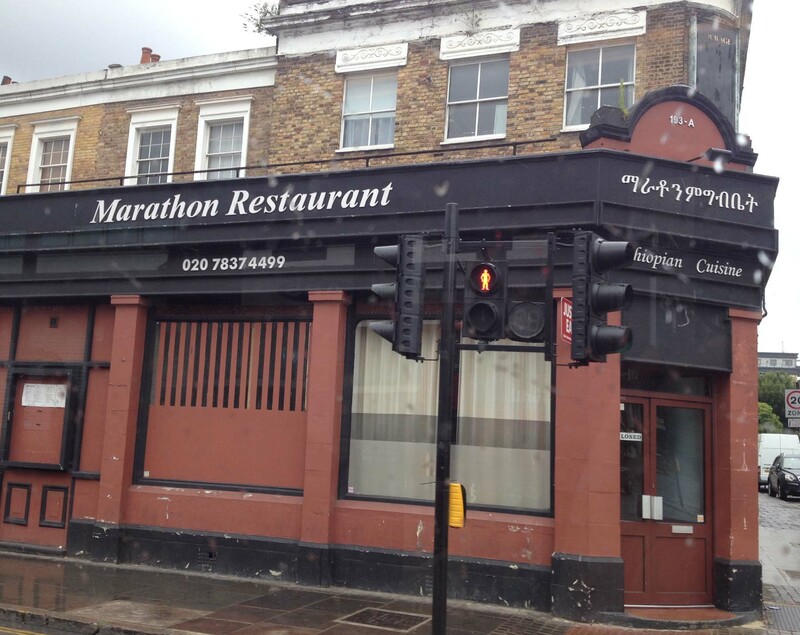 Our forebears wouldn’t have recognised any of these businesses. 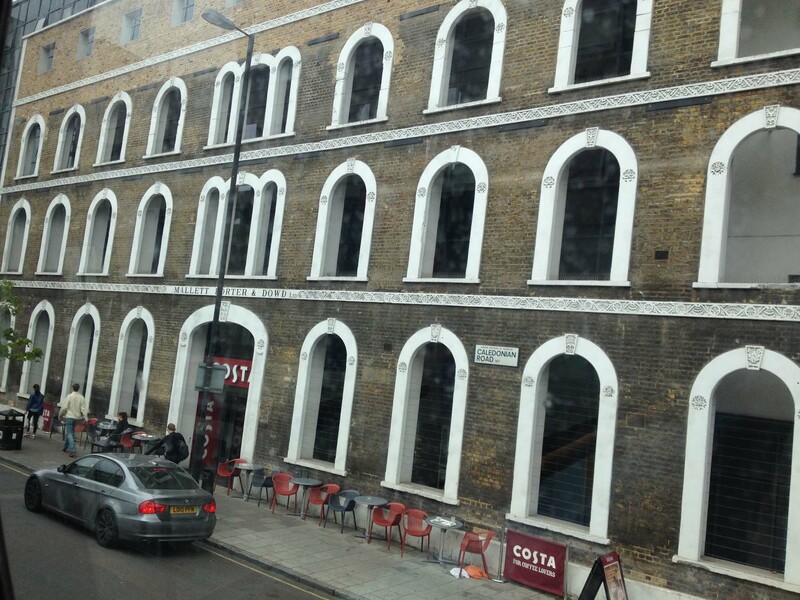 Here, they have kept the façade of the fine old building with the new building just behind – can you see? Contrast this with evidence of modern multicultural London. That sign over the doorway is written in the Amharic script. Remarkably (to me), each character represents a consonant and a vowel. 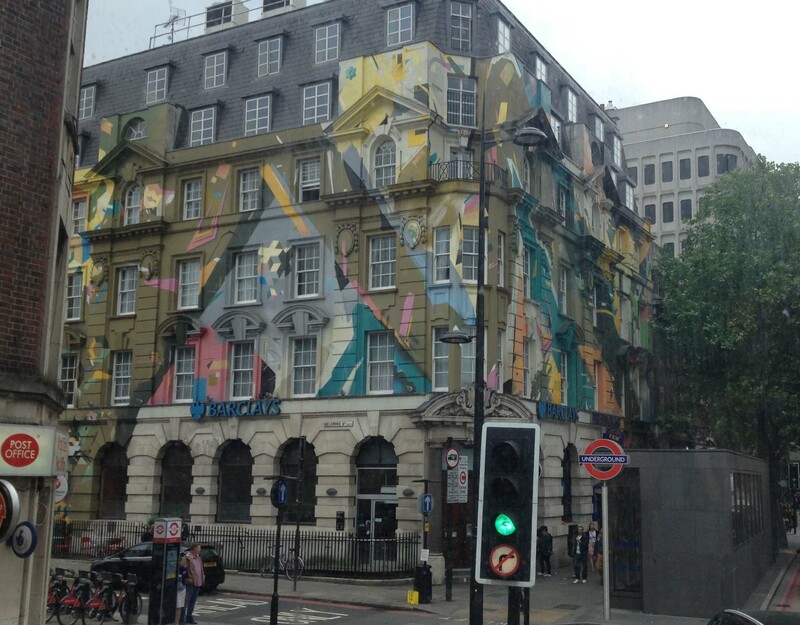 What a riotous explosion of colour on what must have once been a pretty dull building! I always look out for these caryatids on St. Pancras New Church. They have been patiently supporting the roof since the 1820s. 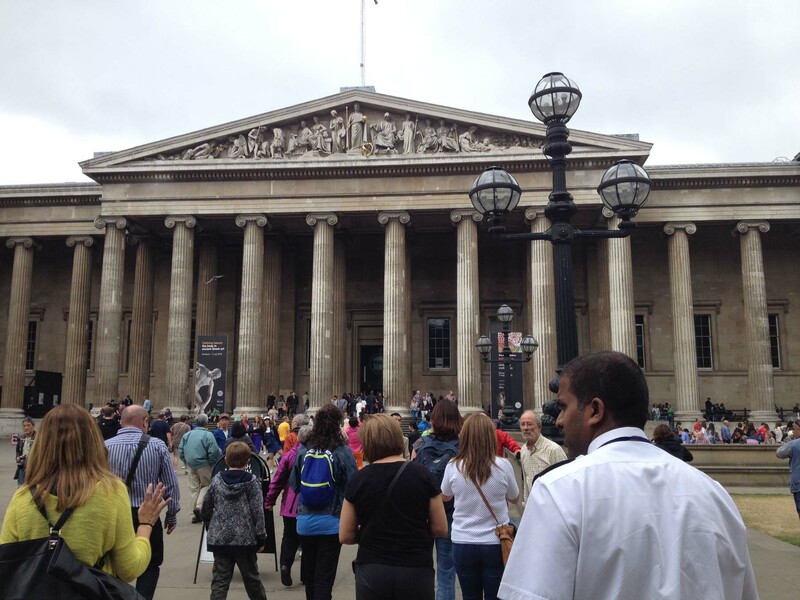 The British Museum is busy, busy, busy. It’s an old friend. I’ve been marvelling at this imposing, pedimented façade for a long time. But the interior is new – and so exciting. This rotunda inside the Great Court is a work of genius, and the roof is just wonderful. So much to see, but we mustn’t get distracted. 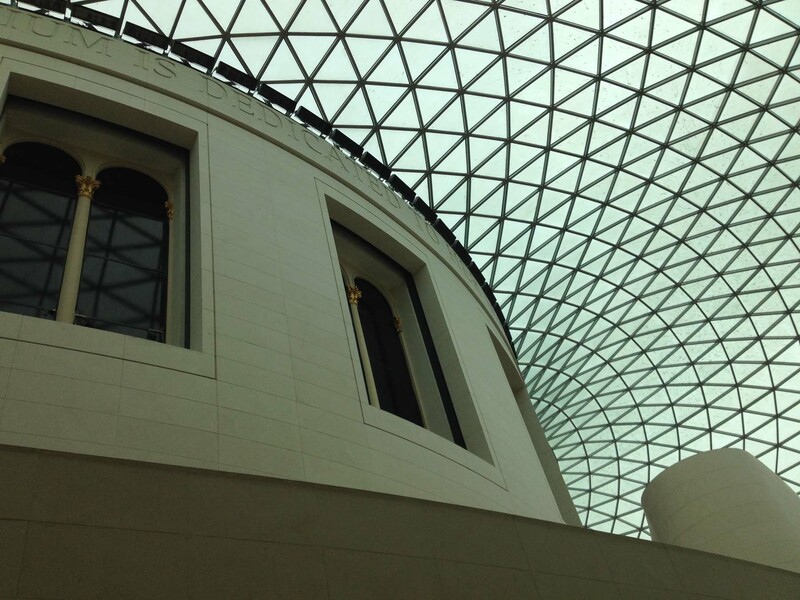 We’ve come to see the British Museum’s Indigenous Australia: enduring civilisation exhibition. Luckily, it wasn’t too crowded so we were able to enjoy the exhibition comfortably. We were asked not to photograph, and articles that I have read since explain that some of the owners of the material have been quite specific about this, even asking that parts of some artifacts be concealed from visitors’ eyes. So, I am only reproducing images that have appeared in newspapers or on postcards. It’s a very powerful and disturbing exhibition – if I were to define it in a couple of words I would speak of loss and dignity. There are objects of great beauty and fascination, but there is no more reason now why they should sit in the British Museum than the Elgin Marbles or the Assyrian carvings. Indeed, it’s worse than that because many of these objects still have significant cultural value to the indigenous peoples of Australia. To the credit of the curator, Gaye Sculthorpe, and her team, they have taken four years to prepare for this exhibition, and consulted widely with the Aboriginal people, respecting their wishes in the display of materials. I think they deal honestly with some very difficult issues. 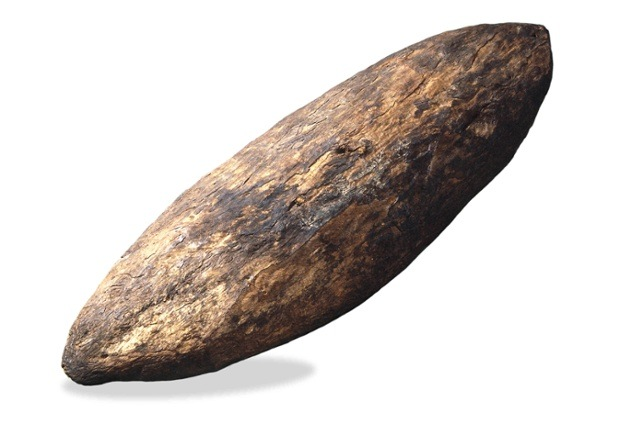 Take this shield, probably collected at Botany Bay during Captain Cook’s 1770 visit. For the Aboriginal peoples, it is a symbol of attack and invasion, for Cook and the colonists it was a foundational treasure. 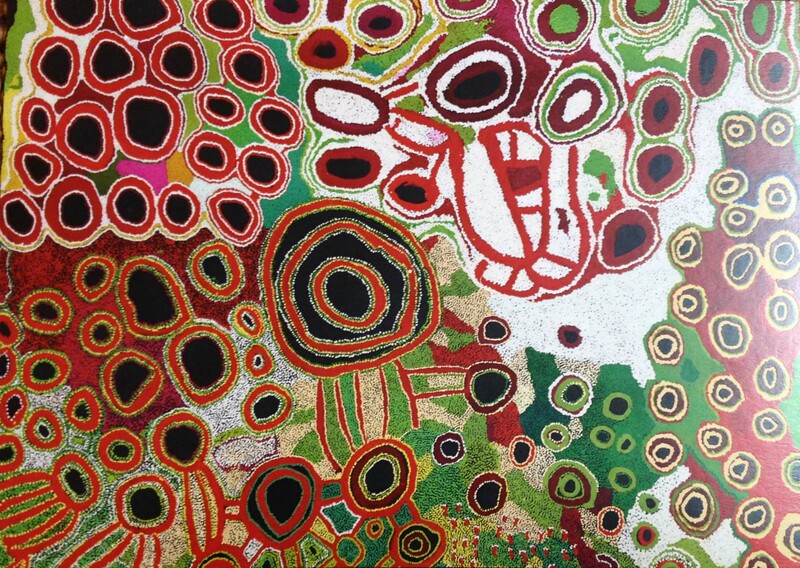 There were the Dreaming paintings that have so attracted Westerners to Aboriginal art. 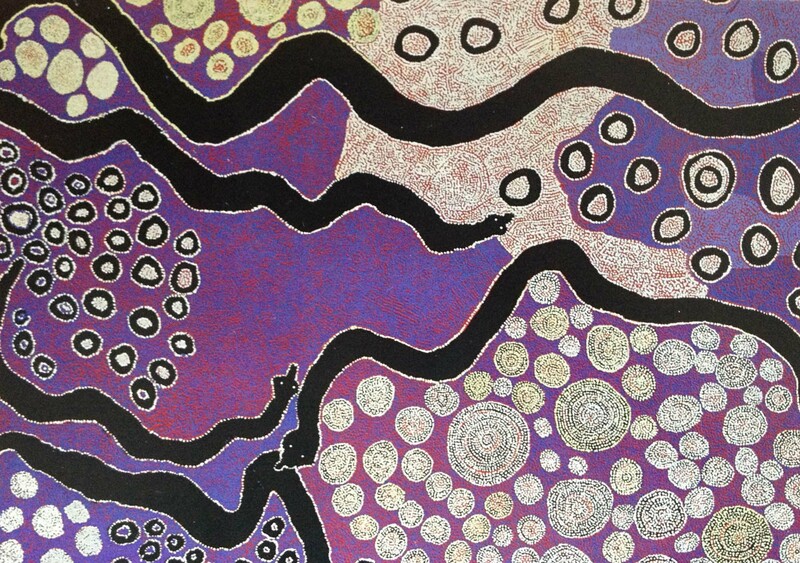 These modern acrylic paintings are by Spinifex people (the upper painted by four men, and the lower by six women) and tell a bitter story. They are the Spinifex peoples’ record of the land from which they were ousted in the 1950s and 60s so that the British and Australian governments might test atomic weapons there. A fine turtle shell, shell and fibre mask from Mer, an island in the Torres Straits. It’s thought to be older than 1855, and is typical of much of the collection that the British Museum holds in that it was donated by the Lords of Admiralty. How did the Lords of Admiralty come to own it, one wonders? Through conflict? greed? scientific research? gift? All part and parcel of Britain’s murky involvement in Australia’s past. It is said that the material on show is just a tiny percentage of what the British Museum actually holds in its Oceania and Australia collections. 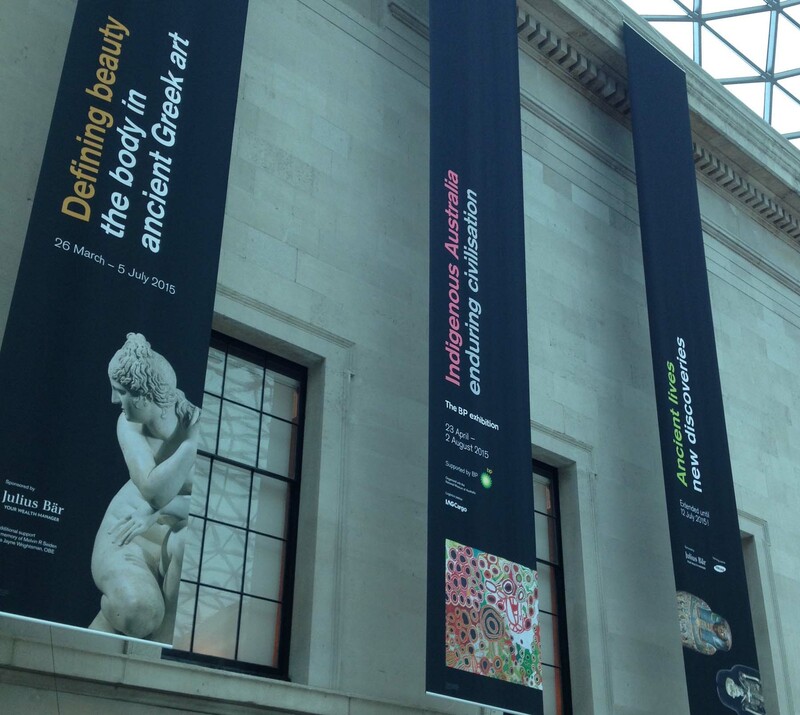 Hmm – what would the British Museum be if it started to return some of its holdings? 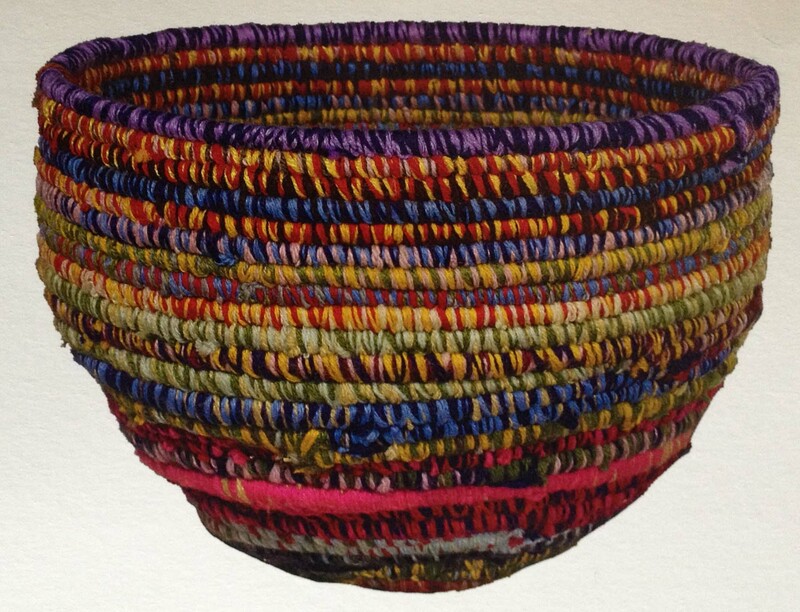 Modern basketware (2010), made of plant fibre and wool by Yuwali (also know as Janice Nixon). 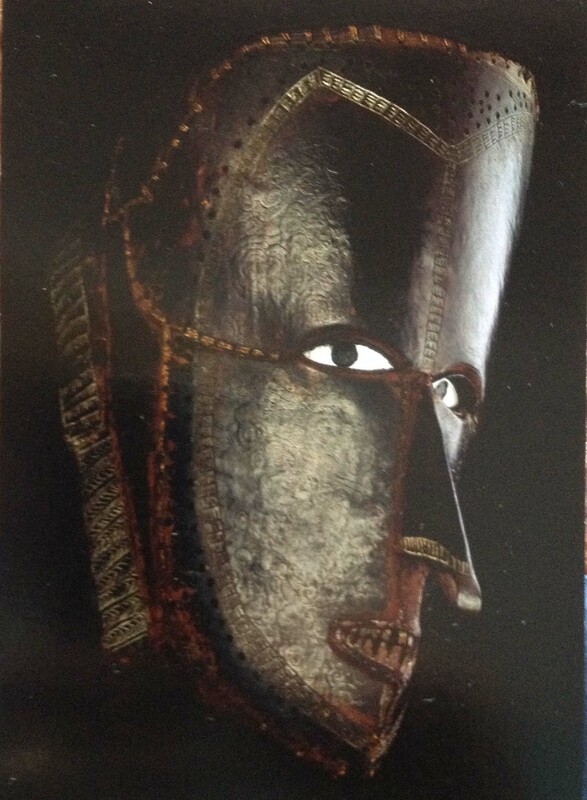 I love this piece – can it be that it is untainted by the dismal colonial story?!! Oh, I hope so. I found myself longing for some salvation from the miserable exploits of the colonial Brits. And I came home with this. 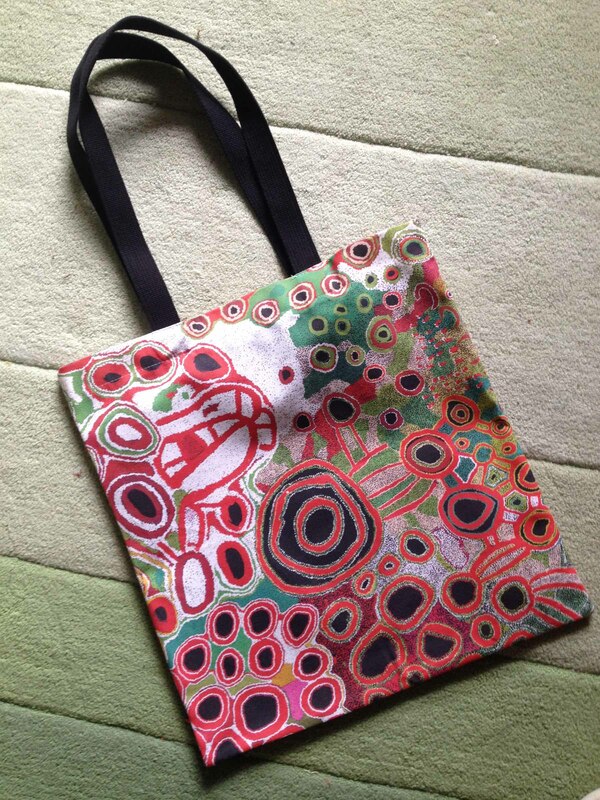 The Spinifex ladies’ painting transfers wonderfully well to artefact, and it’s a lovely bag – with a powerful back story. There’s no doubt that it’s a very interesting exhibition. I learned a great deal, and – in the face of all the criticism that Indigenous Australia: enduring civilisation has drawn – that’s very important. Just suppose we were to turn the tables and someone made the discovery that some Northumbrian Rock Art was lurking in a Sydney museum? and what’s more a Viking-like marauding party massacred, raped and pillaged this local material away? 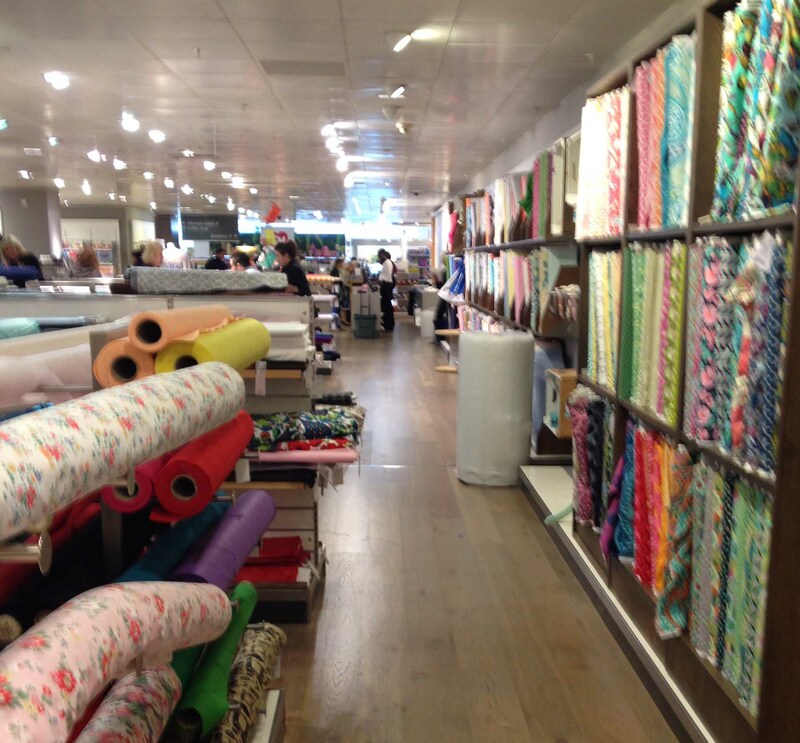 I wanted to buy fabric, and when I was younger, you could buy fine materials in Liberty’s and John Lewis. So thither we went. So disappointing! 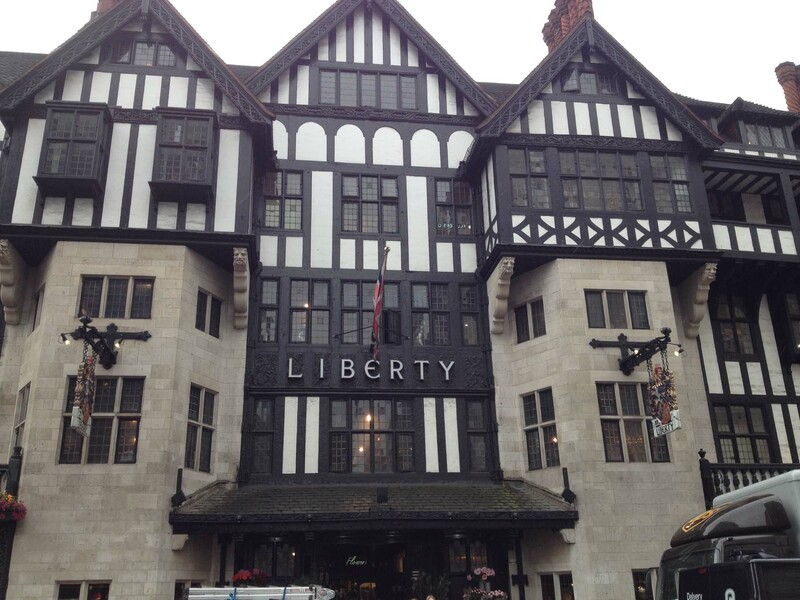 Liberty’s is such a fine store – such a visual delight. But honestly, what rubbish they sell! Colossally expensive really quite ordinary items (shopping bags in the pic below), so I guess they are mainly interested in the tourist market. As for fabric – well, they do sell their lovely Tana Lawn prints, but that’s pretty well all the fabric they sell now. So to John Lewis. If you could count on anywhere selling fabric, surely it would be John Lewis! 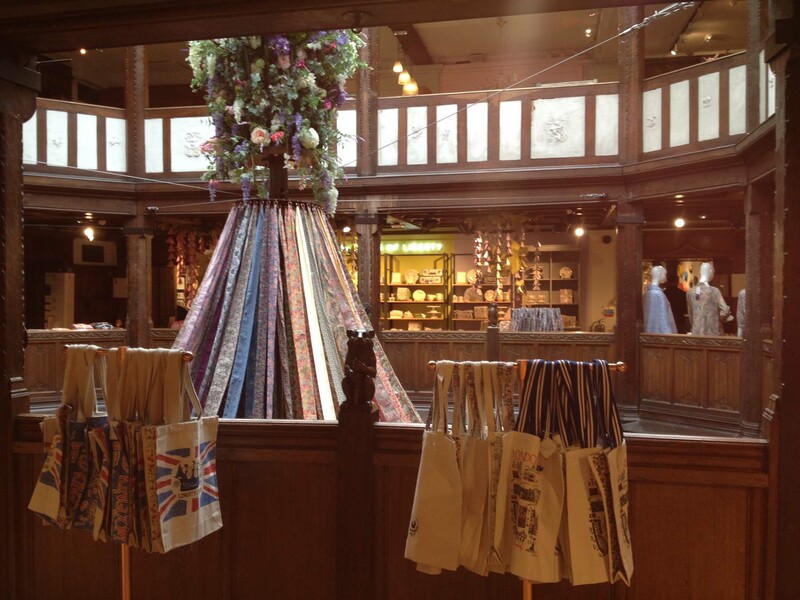 They do still sell fabric, but their stock doesn’t cover almost the entire ground floor (as it used to). It’s a miserable little aisle on the fourth floor. Not what I wanted there either. 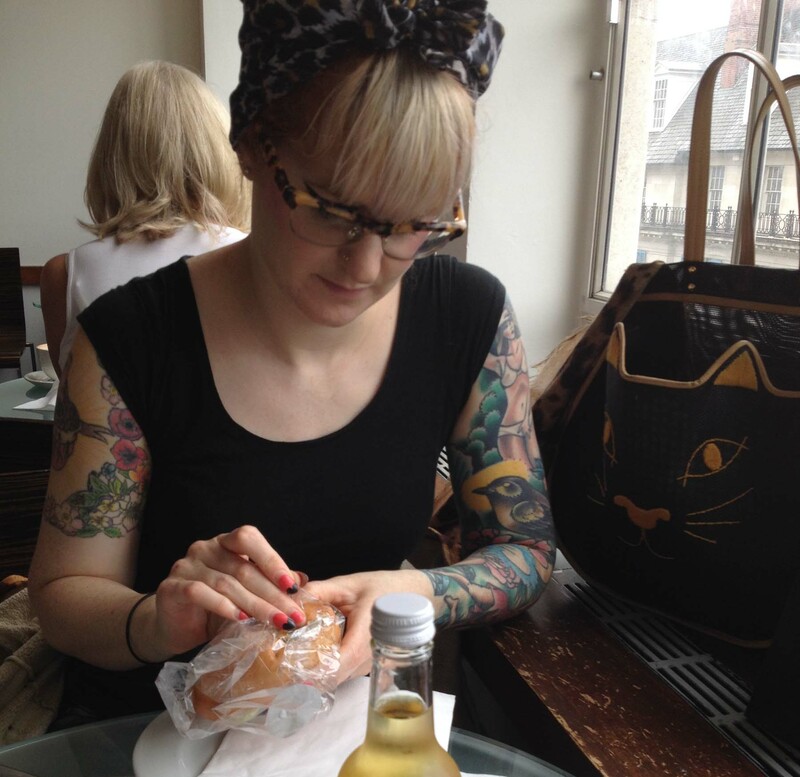 But we did get lunch in the little restaurant overlooking Cavendish Square. 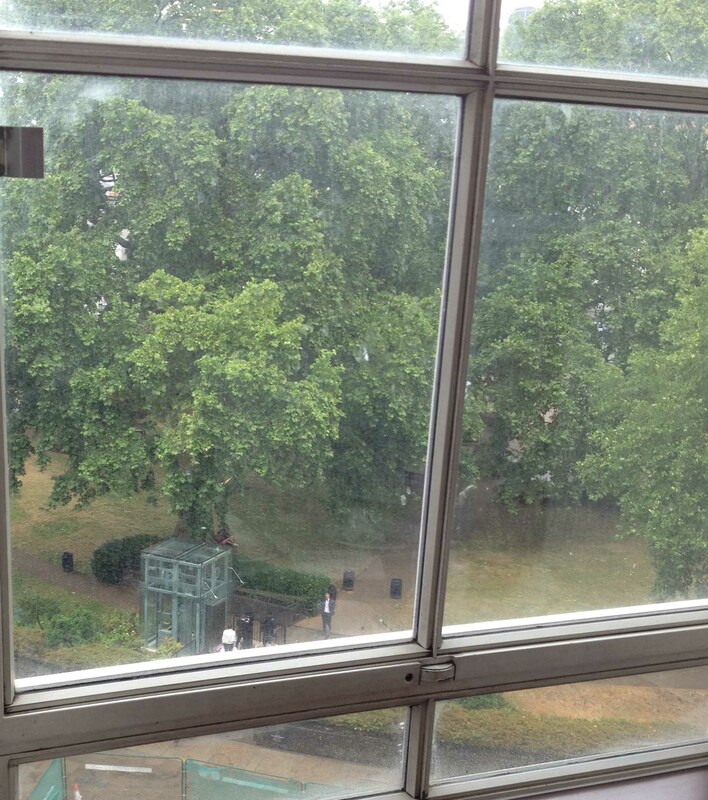 (More London greenery, though the grass is looking very parched, badly in need of heavy rain.) 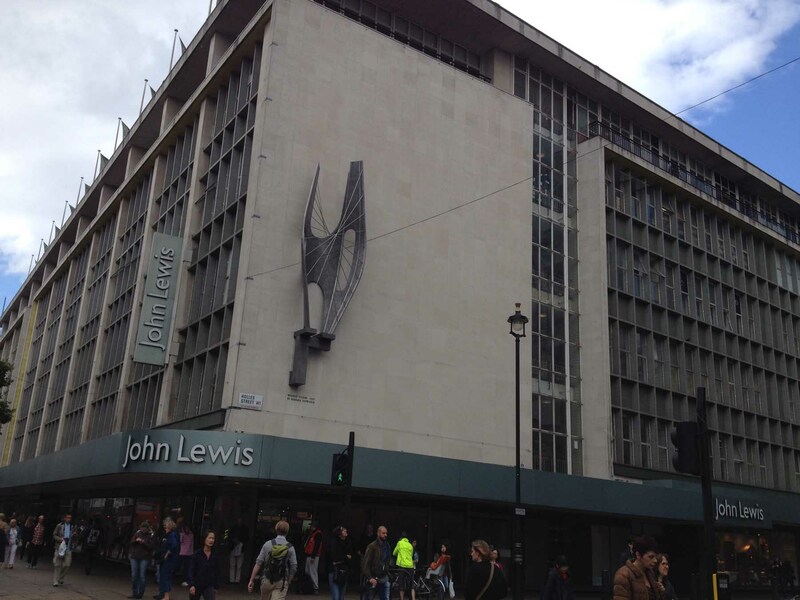 Now, I’m lunching here with my daughter, but I well remember lunching here with my mother when she brought me to John Lewis to buy terry towelling nappies before my babes were born. Of a whim, I looked for nappies today, but could I find nappies for sale – No! (Sic transit gloria mundi!) There is consolation: Helen knows where to go for my fabric. 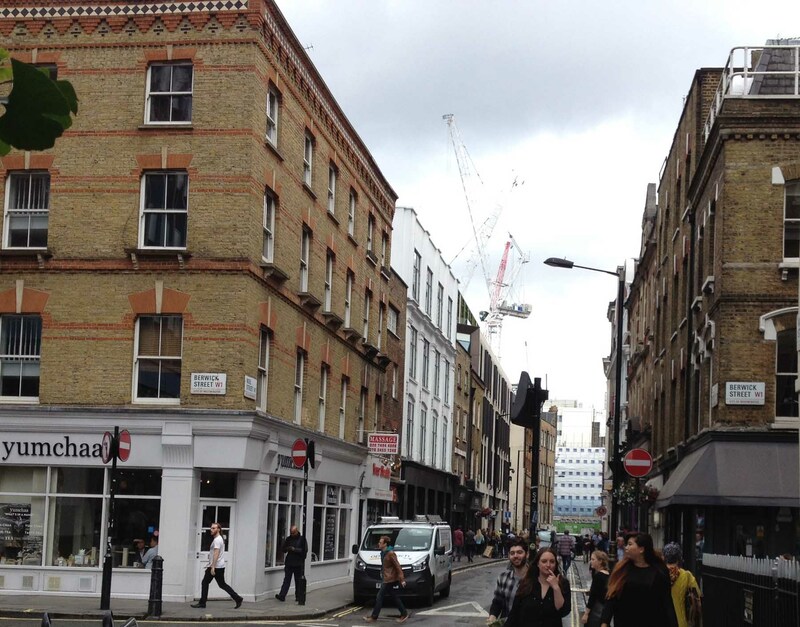 Why Soho’s Berwick Street is the place! (I love it!! After all, I’m hailing from Berwick-upon-Tweed these days! And as ever, I’m fascinated by the buildings – look at the detailing under the parapet on the taller building!) 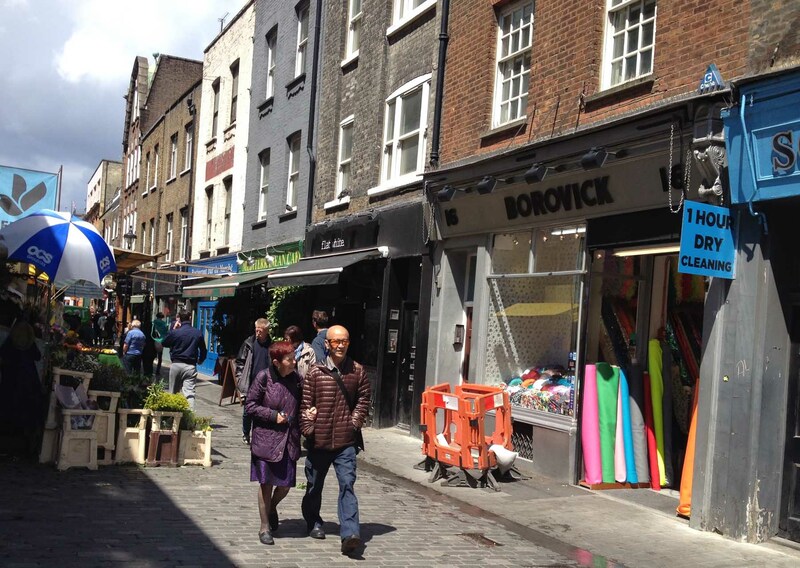 There are lots of fabric shops in Berwick Street, but Borovick is the excellent little shop where I finally find some fabric that I’m pleased with. Time to head back to Helen’s home. 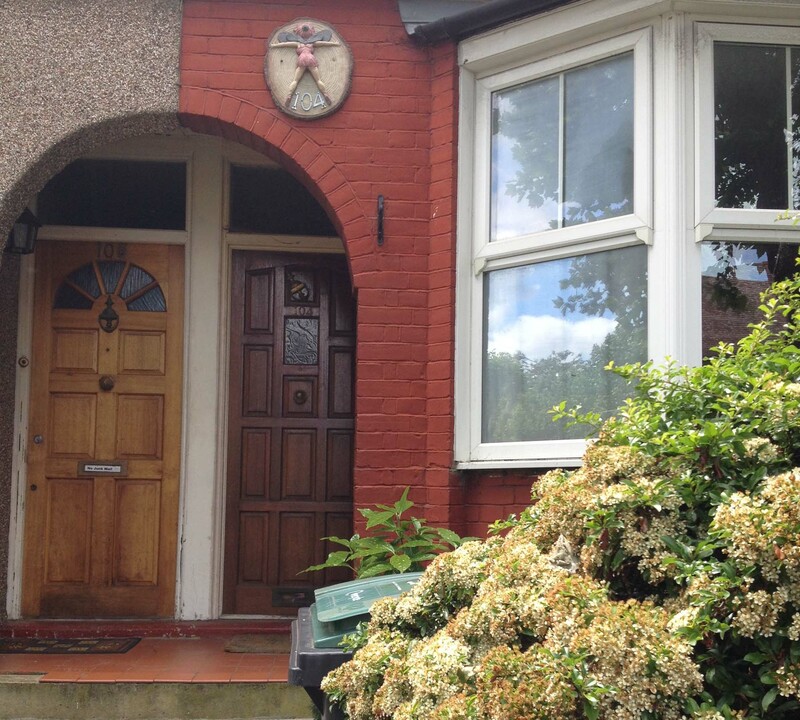 They still haven’t removed the tacky bum-flaunting fairy over the doorway. I rather think it’s going to stay there for a very long time …. 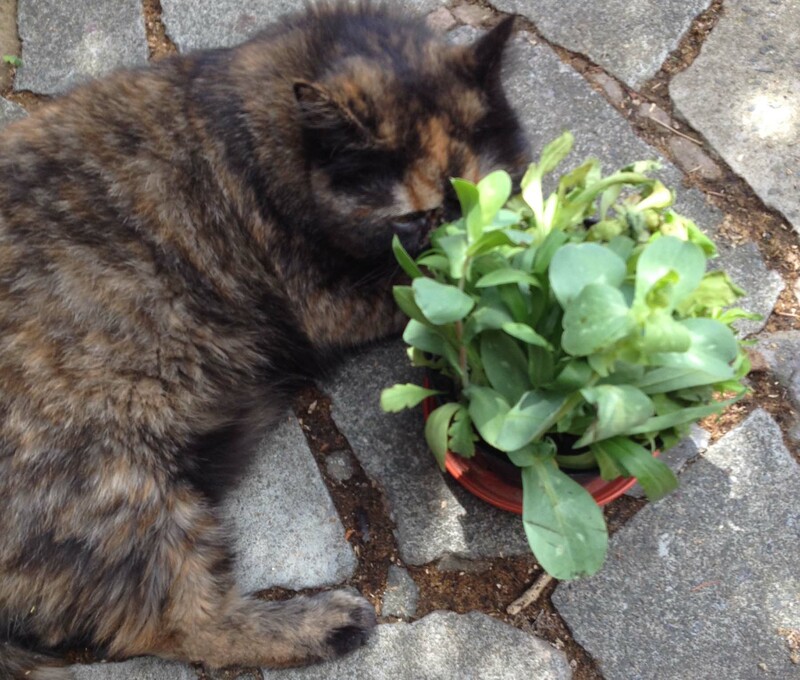 One of her cats is particularly pleased to see that I’ve brought some seedlings with me because there’s several small catnip plants hidden deep in the pot. This is Tottenham’s Tower Gardens, and when I first visited I was struck by the quality of these little homes. 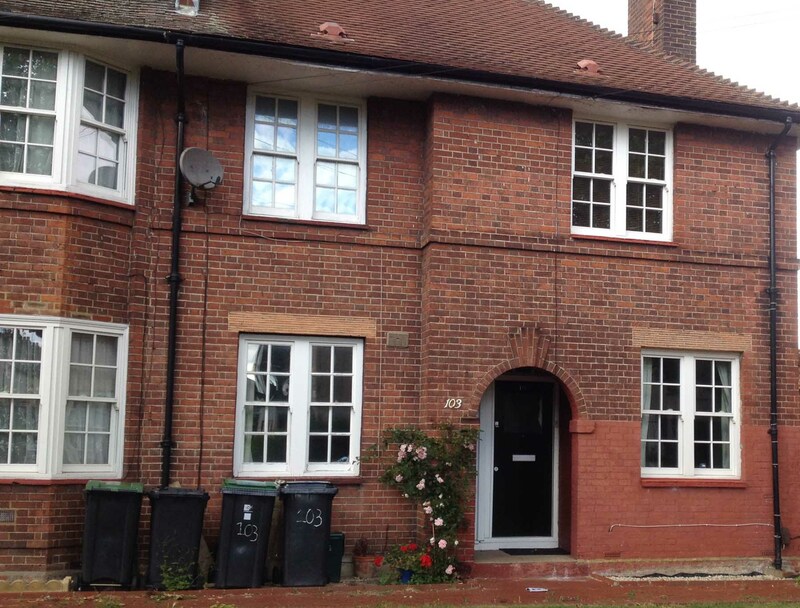 Look at the detailing on the brickwork, the finely-shaped chimneys – and the simple decorative details over the windows. In the late 1890s, £10,000 was donated for the purchase of this land by jewelry magnate, Samuel Montagu. Homes were to be built to rehouse Jewish workers, then living in the crowded conditions of Tower Hamlets in London’s East End (whence the name: Tower Gardens). The chief architect was William Riley. He was a member of the Art Workers Guild which had been founded in 1884 and was an offshoot of the Arts and Crafts movement. 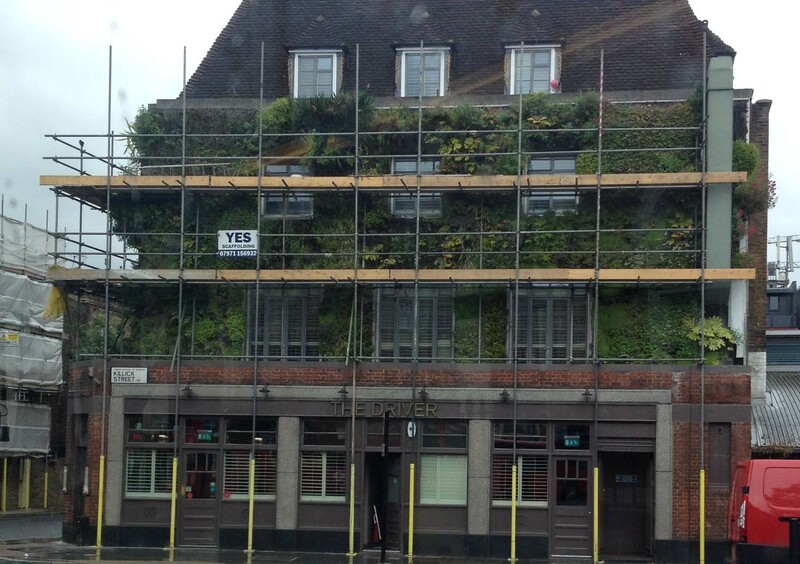 All the details – tree planting, brickwork etc show this influence. It’s a conservation area, but disapppointingly poorly implemented. Look at the changes somebody’s made to this house! Weirdly out of context, but it’s somebody’s home and no doubt they love it. 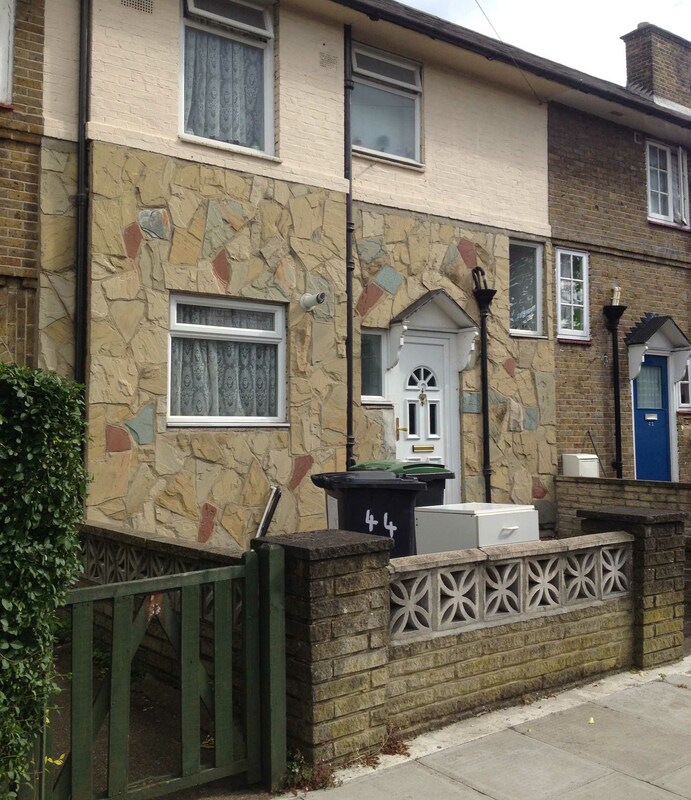 Sadly, modern living (satellite dishes and rubbish bins) don’t improve the look of these charming houses. Then I was grabbed by the names. Where on earth does Waltheof come from (see the sign on the building beside Rose Supermarket below)?! Now it’s a vibrant multi-cultural area as this mini-mart on the edge of the estate testifies. (But first look at the detail of the window in the roof). 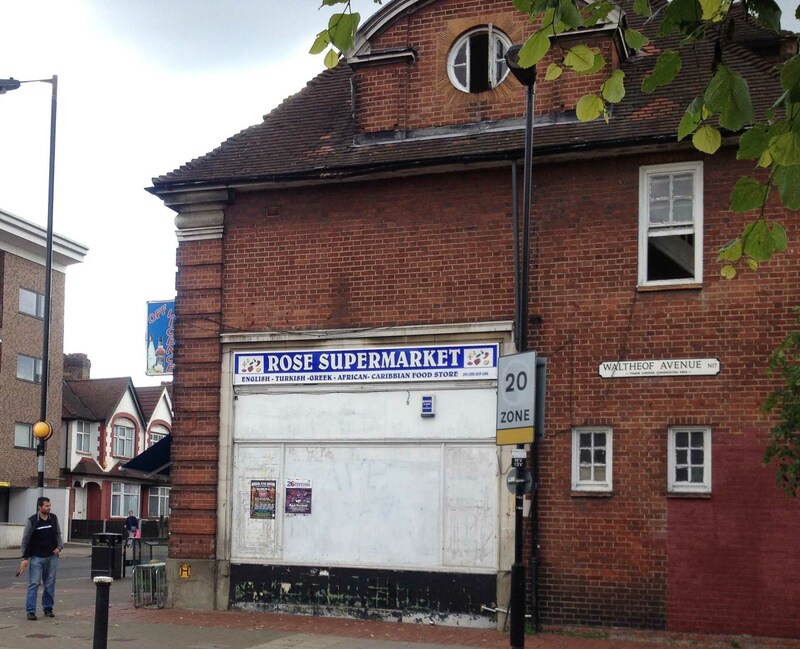 Rose Supermarket caters for English, Turkish, Greek, African and Caribbean tastes. Wow! Before long it’s time to go back to Berwick-upon-Tweed and Northumberland. 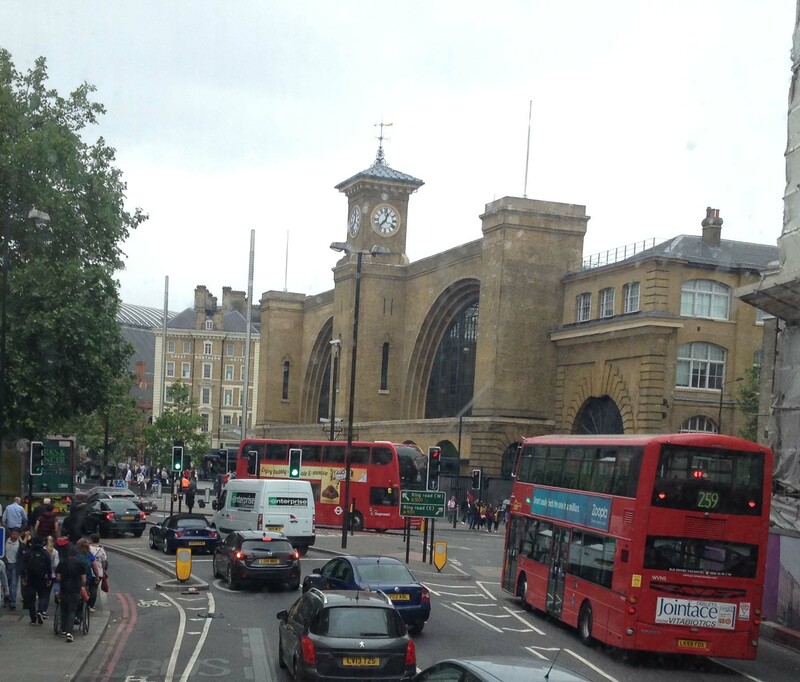 My heart is always warmed by the sight of King’s Cross Station. Such a simple, magnificent statement with the strong lines of those huge arches, and the mellow tones of London brick. Stephen prefers St. Pancras station next door. What a contrast in architecture!! The fact that these two important London train stations sit next to each other is a reminder of their history. King’s Cross was built by the Great Northern Railway company in 1852 (designed by Lewis Cubitt), and St. Pancras, serving the Midlands and Yorkshire, was built a few years later (1868) for the Midland Railway company. The famous frontage on the Euston road (which you see in the picture below) was actually the former Midland Grand Hotel, designed by George Gilbert Scott. I wonder which you prefer? Never mind – we’re going to the north-east, so it’s King’s Cross for us. 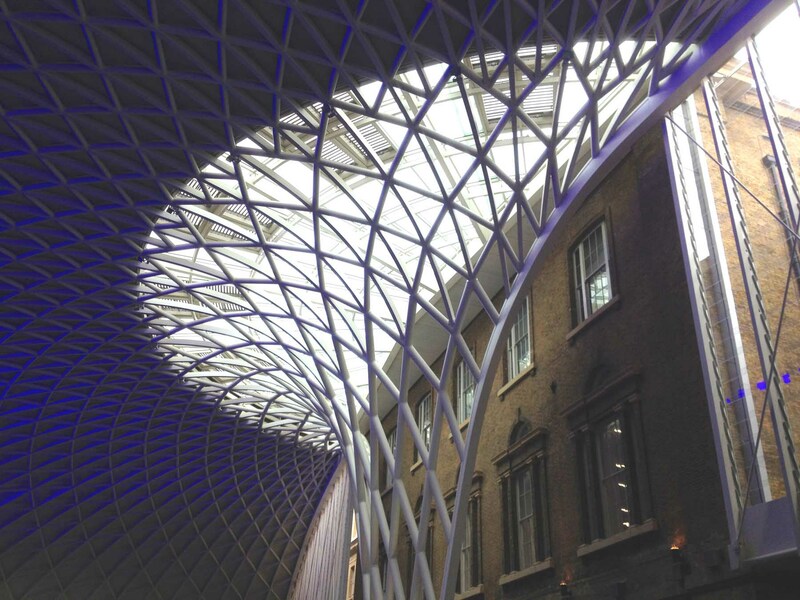 Just look at this wonderful ceiling in the revamped and extended station building. I think Lewis Cubitt would be well pleased by what they’ve done to update his station. Loved seeing all the buildings, thanks for the memories and the tour. So exciting to get your comment, Susan, and even tho’ we’ve never met, to make contact through these shared experiences. The interweb is just brilliant when it works like this! I loved hearing about your shopping in Liberty’s – and wow – that Gallerie Lafayette wedding dress sounds amazing (even if it was pink…) – wish I could see them. So glad you enjoyed my post – and thank you so much for your comment. Oh, there is almost too much wonderful in here! I really enjoyed your trip to the museum especially after reading some of the articles you suggested. I can relate to visiting fabric institutions that have fallen, that is a sign of the times, as are the hole in the wall treasures that folks who know us well can recommend. I laughed at you visiting Berwick in London as we crossed the Tweed River in NSW/Queeensland yesterday! OOh, I had to check out your Tweed river! Thank you for mentioning it – I’d never heard about it. And what a great river it is, so appropriately named after another great Tweed river. Names are so interesting – they tell us so much about the people who lived in these places before us, and none, I think, are more poignant than those of settlers in new lands, remembering the countries they have left. Thanks for your views on the Aboriginal exhibition. How fascinating and thought provoking. Glad you enjoyed reading what I wrote about the Aboriginal exhibition – I do really recommend a visit if you have the opportunity. How clever of you to make London sound so interesting even to someone who goes there a lot! Your poignant comments make me want to visit the Aboriginal exhibition. Love the way you draw attention to all the buildings and history. I prefer St Pancras! But love the new interior of K’s Cross. Aah – you’re with Stephen then, if you prefer St Pancras!! Definitely recommend the Aboriginal exhibition – it’s strong stuff, but very impressive. 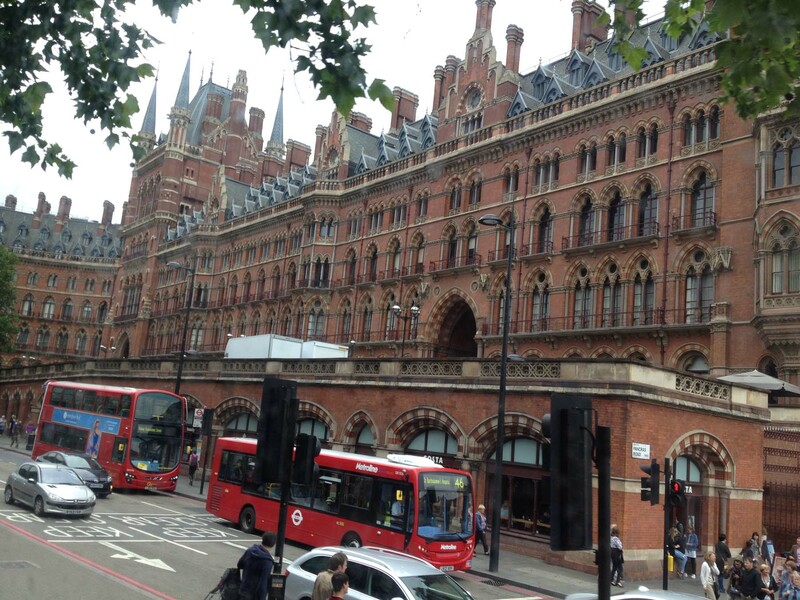 aah – you’re with Stephen then, if you prefer St Pancras! I do recommend the Aboriginal exhibition – it was very powerful and disturbing, but so interesting too.